Blueair 203 HepaSilent air purifier is a great choice to buy especially if you or someone of your family members have an allergy or asthma problems. This BlueAir 203 uses HEPASilent filter technology. It makes filtration even better as it traps six times more particles than usual filters. It is brand new technology. Captures 99.97% of airborne particles as small as 0.1 microns! That is excellent knowing that True HEPA filter can catch particles larger than 0.3 microns. The Blueair Purification System removes any types of pollen, mold, allergens, viruses, pet dander, bacteria, and dust. Blueair’s compact 203 air purifiers are ideal for smaller sized bedrooms and offices up to 240 sq. ft. Featuring HEPASilent technology and environmentally friendly filters, the Blueair 203 can deliver more clean air at a faster rate with less noise. Its three speeds are silent, and on the lowest speed, you can barely tell it is on. It is certified by Association of Home Appliance Manufacturers (AHAM) in clean air delivery rate (CADR) and uses only 20 watts on low and 80 watts on high speed. Blueair air purifiers are made for continuous use 24/7. Their Swedish design is not only attractive but built to last for years. What is this Blueair 203W HepaSilent air purification system? The Blueair 200 series air purification systems are surely one of the best on the market today! Blueair 203 HepaSilent air purifier is intended for rooms up to 240 square feet. If you need an air purifier, with HEPA silent, for even larger rooms then check out Blueair 503 Hepa Silent Air Purifier review. It uses gas sensors too so that you can be sure the unit is doing its job in removing airborne particles. The electronic display will inform you when the filter is needed to be changed, so you don’t have to worry about it. Blueair HEPASilent particle filter uses polypropylene fibers which capture 99.97% of particles from the air which are as small as 0.1 microns. That makes this air purification cleaner excellent choice for allergy and asthma sufferers. Blueair 203 HepaSilent air purification system will also reduce the level of ozone in indoor air. Ozone is by some studies bad for lungs. The Blueair 203 air purifier is designed for rooms up to 240 square feet. Silent mode is just that, silent. Easy to use, simple to replace filters. Comes with a filter. It has three fan speeds. On the lowest speed, you will barely hear any noise. It is best to use the lowest speed setting when you sleep. On highest fan speed it will clean faster and more efficient. Then it could be little noisier but nothing that will disturb house peace. It is just air going through the filter, and there is not much that can be done about it. It is so-called “white noise” which can even help you sleep. Not only does it clean the air, but produces white noise which helps block out the noise of your neighbors. I will advise, it is quite loud on the medium and high settings, but produces great airflow if you have lower ceilings. You won’t even need a ceiling fan with this turned on high…. Its power usage is very low, and thanks to that Blueair 203 slim HepaSilent air purifier is energy star rated. It does not have any wheels so you can’t push it around. Its measurements are 9-1/2 by 17 by 21 inches so it can be put almost anywhere. It depends on where you buy your Blueair HEPA silent air cleaner, but it mostly comes with five year warranty. If Blueair 203 is used 24/7, the filter will probably be needed to replace every six months. Replacement filter cost about 50$. Hepa Air Silent uses three-stage filter technology that captures particles in layers depending on size. The first stage traps larger particles like dust and pollen while second and third stage trap smaller particles like viruses, bacteria and more. I am not sure how well it removes odors. But according to some comments, it doesn’t remove smoke or kitchen odors. If you still want HEPA silent air purifier which removes odors like smoke, then look at Blueair 503. How Blueair 203 Slim Air Purifier Works? The Blueair air purifiers intake air through the back of the unit. The air is passed through the pre-filter where large particles are trapped, then through the electrostatic HEPA-type filter where the small particles are trapped, and then through the ionization chamber where the air mixes with negative ions. Negative ions are then released with the clean air through the top of the unit. The ions collide with the particles in the room air and the particles become charged. Then when the air cycles back through the unit, the charged particles cling to the electrostatic filter media. The combined filtration technologies allow the Blueair purifiers to achieve 99.97% filtration efficiency. If you want air purifier with a permanent filter, true HEPA filter or just something cheaper, then look Honeywell or GermGuardian. Like other Blueair models, the 203 unit filters the air using the company’s patented HEPASilent technology and 3-stage filtration. On its lowest speed, the 203 traps 99.97% of particles sized at 0.1 micron using a combination of mechanical and electrostatic processes. Each unit comes with a standard particle filter kit. For additional smoke or odor control, an optional SmokeStop Filter Kit is available for purchase. Particle Filter – This filter is made of polypropylene and a small amount of activated carbon. Best for removing allergens, the filter is capable of collecting dust, pollen, bacteria, pet dander, mold spores, and other airborne particles that can easily trigger symptoms. The filter’s activated carbon component is effective in removing some odor and gas traces. SmokeStop Filter – This polypropylene particle filter is enhanced with under a pound of activated carbon. Best for use in spaces where odors and gaseous pollutants are present, this filter removes cigarette smoke, cigar smoke and other volatile organic compounds in addition to allergen particles. To help maximize filtration effectiveness, the 203’s internal ionizer exerts a negative charge over incoming particles, which helps them become more readily captured in the filter. To maintain the unit’s optimal air-cleaning performance, remember to replace the filter every six months. The unit’s magnetic filter replacement indicator will remind you when it’s time. Remarkably, the Blueair 203W purifier can achieve an air change rate of 5 air changes per hour. This means the air purifier cleans and completely replaces all of the air in the target size area (240 square feet) 5 times in a given hour. Not many comparable air purifiers can do the same, and this is one of the things that sets a Blueair purifier apart from the competition. You’ll enjoy cleaner air and fresher air as the day goes on. Specialized materials, such as noise-muffling galvanized steel, and precision Swedish engineering help this Blueair 203 purifier clean your indoor air without the noise associated with less advanced units. On its lowest setting, the 203 model emits less sound than a desktop computer (32 decibels). Helping it to achieve exceptionally quiet operation is its HEPASilent filter system. Because the filter traps particles using both mechanical and electrostatic means, room air flows more freely throughout the unit. 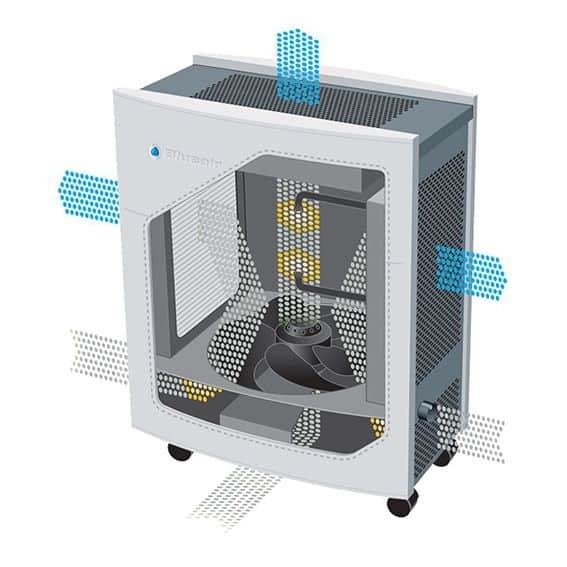 Since air passes more easily through the lightweight filter, the unit’s internal fan does not have to work as hard or as loud to generate air movement. Energy Star-rated, the Blueair 203 uses significantly less power than other units, which means you can run the system round-the-clock without seeing a steep jump in your electricity consumption. In addition, the Blueair 203W emits zero ozone and is constructed of environmentally friendly parts and materials to help protect the planet as you protect yourself with cleaner air. Been using it for a couple of months now. It runs on high all day and low at night when sleeping. The filter is starting to get dark, so it’s collecting something. I use to dust every 3-5 days, but now I can go two weeks before I even see a hint of anything. I will prob get the charcoal filter when it’s time to change out the filter. Low speed is like a quiet fan. The Particle and SmokeStop filters are made of non-toxic polypropylene, which ultimately breaks down into water and carbon dioxide when burned. These filters also contain no triclosan or other harmful chemical additives. The air purifier’s galvanized steel housing is powder-coated for endurance and protection, without introducing the possibility of chemical outgassing. While they are built for years of efficient use, all Blueair air purifiers, including the 203, are designed to be disassembled, and the components sorted and recycled. The Blueair 200 series is the perfect choice for someone on a limited budget who wants an efficient, well-made air cleaner for a small room. Although Blueair has diverted to a different design with the 200 series, the efficiency at which it performs is not affected. It continues the reputation Blueair has for making silent air purifiers, and this one happens to be their quietest. It is even notably quiet on the high speed. Like the other models, the filters need to be replaced every six months, and they are expensive at $100 to $200 annual cost depending on whether or not one chooses the HEPASilent particle filter or the Gas and Odor SmokeStop filter. We wish Blueair would have designed their units with a separate pre-filter to extend the life of the primary filter and lead to less overall maintenance costs in the long run. However, the addition of a pre-filter could affect the airflow reducing its room coverage, resulting in the need for a larger fan which would increase the noise level. Therefore, Blueair decided to stay with their current design of 3 filters-in-one which remove the large particles in the front, medium size towards the middle and ultra-fine towards the back. Overall, a great quiet air purifier for a small room. It is one of the most preferred purification systems. Mostly because of its advanced performance. It is not cheap but considering the features that this unit contains it can be considered worthy to try out. Winix Air Purifiers Comparison Table – Which To Buy?